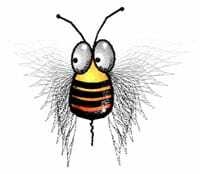 Created for EG&G X-Ray Division in Oak Ridge Tennessee, this bee illustration was created as part of a magazine and print campaign using humor. Food packaging for snack foods, cereals, breads and other consumer goods demand considerable resources to quality control food and safety. There are many ways that food product can become contaminated in the packaging process. Machine parts, adhesives, inks, lubricants, rodents, and airborne particulate can end up sandwiched in the container with the food. Humor is rarely used in a highly technical industry. The science of food production is a serious business. Especially, when developing technologies which detect foreign objects in packaged food products. EG&G Instruments create X-Ray equipment that isolates contaminated foods within the packaging stage of production. Colorful illustrations were created to catch the attention of magazine readers. Combined with bold headlines, the print ad campaign produced the desired results: more inquiries.